Amritsar, August 25 (AP): Doctors in Amritsar in the state of Punjab in Northern India have surgically removed 40 knives from the stomach of a man who had swallowed them over the past two months, one of the physicians said today. 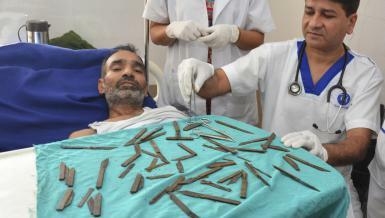 The 42-year-old man is recovering in a hospital in Punjab state after undergoing surgery Friday in which doctors removed the knives — some folded and some with exposed blades up to 18 centimeters (7 inches) long. Dr. Jatinder Malhotra, who assisted during the five-hour operation, said the man, who works as a police constable, was apparently suffering from a psychiatric disorder and is now being counseled. Malhotra said he had never before heard of a case of a person swallowing knives. “In my 20-year career, and in all the medical literature that we checked, there has never been a case like this one, where a person has swallowed not one, but 40 knives,” said Malhotra, a critical care doctor at the Corporate Hospital in the city of Amritsar. The man, who has not been identified, had come to the hospital two weeks ago complaining of severe pain in his abdomen. A team of two surgeons, two critical care physicians and an anesthetist conducted the surgery, during which they initially removed 28 knives. But further investigation revealed 12 more, the hospital said. There was massive internal bleeding during the surgery because the knives, which were all made of iron, had lacerated the man’s stomach walls, Malhotra said. Since the surgery, the man has told doctors that he can’t bear to look at another knife. “He even asked his wife to get out of the room when she was cutting some fruit for him,” Malhotra said.